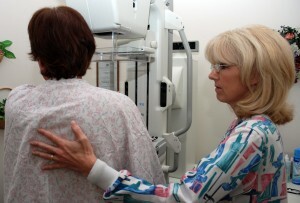 As women are well aware, the purpose of a mammogram is to screen for cancer. What many women don't know is that as part of the screening, radiologists also assess the level of density in a woman's breast tissue. Starting Monday, a new California law will require that doctors notify women if their breast tissue is dense. Dense breast tissue makes it harder to read mammograms and is associated with an increased risk of breast cancer. Former state Sen. Joe Simitian (D-Palo Alto) introduced the law last year. It grew out of his concern that while doctors were aware of a patient's breast density, the patient herself was not, preventing women from talking with their doctors about how they might want to address their potential increased risk. He wanted to change that. "The fundamental premise of the legislation," he said in a recent call with reporters, "is that absent this information, these conversations weren't going to take place." Some background: breast tissue is graded from 1 (not dense) to 4 (extremely dense). The law requires that women graded either a 3 or a 4 be notified. But here's where the law and medical data collide: while there's fairly solid scientific evidence about the increased breast cancer risk for women with a "4" rating, there's not for women with a "3" rating. Yet, women with a "3" rating will be notified. To put the increased risk in perspective, a woman in her 40s with "extremely dense breasts" has roughly the same risk of breast cancer as an average-risk woman in her 50s, according to a study of nearly 1 million women published earlier this month by researchers from UCSF. About 12 to 15 percent of women in their 40s have "extremely dense breasts." So, what's a woman who receives the notification to do? The law simply suggests women decide on a course of action with their doctors. The UCSF study looked specifically at the issue of breast density and found that women in their 40s with "extremely dense breasts" should have a mammogram every year. Major guidelines conflict as to the frequency of mammograms for women in their 40s. One says annually; another says it's a woman's individual choice. But this most recent study from UCSF suggests that women in their 40s with extremely dense breasts will reduce their risk of being diagnosed with advanced disease if they have a digital mammogram every year. For women in their 50s, the researchers found no increased risk of late- stage disease if a woman had a mammogram every two years -- no matter how dense the breast tissue is. So, that's some of the most up-to-date research on mammography. But the new law also mentions deciding "which screening options are right for you." The press call with Simitian included a radiologist and a nurse. Both discussed ultrasound screening for breast cancer. But Karla Kerlikowske, biostatistician and lead researcher of the UCSF study, said that while she supports women having information, in this case, the law may be ahead of the science "because we don't know that women need additional imaging tests beyond digital mammography if they fall into one of those (breast density) categories." In a subsequent email, Kerlikowske said that there are no studies of what's known as "whole breast ultrasound" to determine cancer detection and whether detection makes a difference in cancer staging. Women with higher breast density are also at higher risk of false positives and might need to go through additional imaging and unnecessary biopsies. As Otis Brawley, chief medical officer of the American Cancer Society, noted, "The thing that increases risk also makes screening more difficult to do. God is not fair here." Perhaps that is what's most worth remembering: that life is not fair. At a time when people in general -- not just women -- want certainty in the face of a possible disease, medical science cannot yet provide it. Again, what should you do if you get a notification of high breast density? Talk to your doctor.